Moola is an 8 month old Staffordshire bull terrier, she is extremely loving, affectionate and mostly well behaved. However, when Moola is left on her own, she becomes a completely different dog and starts destroying carpets, floors, doors, furniture – basically anything she can get her paws on. This behaviour is a strong indicator that Moola suffers from intense separation anxiety. When Moola became suddenly unwell, her owners were concerned something had happened while they were out, so they rushed her to The Vet. 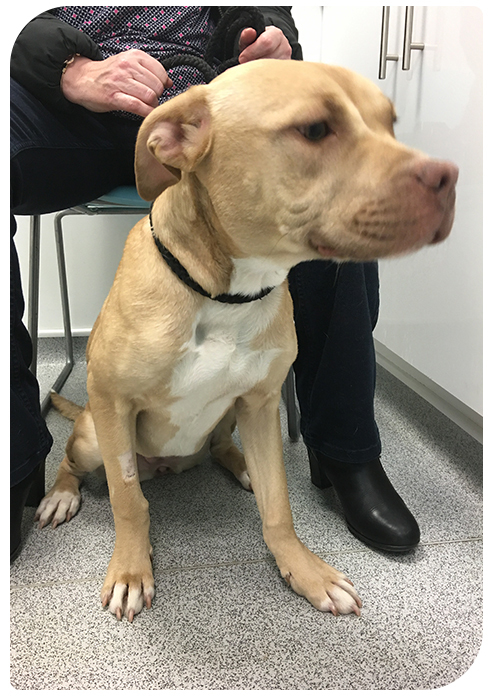 After a thorough examination and an X-ray by one of our Clinical Directors, Jessica, it became apparent that Moola hadn’t only been chewing up the house, she had been eating away at it too as there were bits of carpet stuck in her stomach and bowels. Emergency surgery was performed and Jessica soon found that 15cm of Moola’s bowels were so damaged from the materials she had ingested, that they needed to be repaired. The team were amazed to discover and remove such a huge quantity of carpet, vinyl flooring, shoe laces and much more from her bowels.Unfortunately the picture we have is a little bit too gruesome for some viewers – it even made some of our stomachs turn! After the surgery Moola was still in a critical condition. It was too early to tell whether her bowels and stomach would be able to regain full function and if the internal infection would be too hard for Moola to fight off. Moola had been through 3 hours of extensive, complicated, delicate bowel surgery on a Saturday evening and several days hospitalisation and against all odds, survived! She made steady progress, and now her owners are pleased to report that she is eating well and feeling bright and happy again!